The Community Services Specialists provide referral services connecting people to resources in the community. Although there are no financial resources at this time, staff works closely with enrollees in identifying their needs, making appointments, preparing paperwork, applications, documentation, transportation to equip people with the knowledge of how to access resources. Qualifications: People must be 18 years of age or older, commit to actively participating in the voluntary program, and experience multiple barriers to self sufficiency. Priority will be given to low-income households. Bridges is a temporary emergency assistance program, that provides eligible clients with direct financial assistance and referrals. Households may be assisted in paying rent, utilities, car repairs, work related clothing, and gas cards or bus passes. Staff may also refer households to organizations and resources within the community that can assist individuals with a variety of needs, or may connect them to the PASS program. Qualifications: Must be 18 years of age or older, and live in Winnebago County (excluding Neenah and Menasha), and have verifiable income. Fresh Start is a paid employment and training program that serves participants between the ages of 17 and 24. The program works with young adults that have multiple employability barriers. 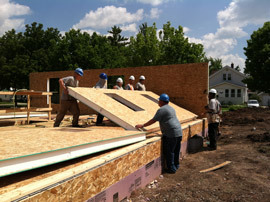 It assists the participants with working toward getting their lives on a better path while building a house that is sold to a lower moderate income family. Program participants can work toward earning their high school diploma (GED or HSED), and getting through other barriers that may be stopping them from obtaining employment in their field of choice. The programs emphasis is on positive rewards that come from physical work and healthy human interactions. For further information regarding the Fresh Start Program please click here.